Yes, I am the nut case who believes apostles still exist today. I’m even posting a series over at my co-authored blog, To Be Continued, of which I am about half-way through. I recently posted considering the apostles that actually existed in New Testament times (there were more than we think!). In the near future, I am writing a paper for the churches I work with, and one major point I will consider is the nature of apostolic ministry today. 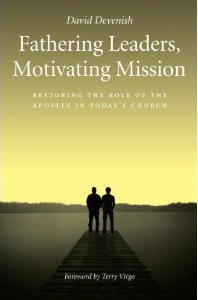 And so I was specifically made aware of a new book that came out this past summer entitled Fathering Leaders, Motivating Mission: Restoring the Role of Apostle in Today’s Church. The book is authored by David Devenish who works with the UK-based church network known as New Frontiers. This is a group of ministries (i.e. people from Eph 4:11-13) and churches that arose out of the restoration movement in the UK back in the 1960’s and 70’s. They are probably the largest of its kind in the UK. Introduction – Why Is This Book Needed? Apostolic Teams – What Are They and How Do They Function? This is a full-fledged work on the topic, weighing in at 320 pages. I believe it will be a good engagement for my own self on the topic of apostles today, as well as helping me consider some issues on the nature of apostolic ministry today as related to the paper I will be writing. So, if your interest has been piqued on apostle’s today and their role today (by my series or by hearing about this book), check it out at Amazon.co.uk. I think the topic is well worth investing in, since they are a very important part of who Jesus is and what he has called his church to be until the parousia-return. This entry was tagged apostles, apostles today, books, Ephesians 4 ministries. Bookmark the permalink. And the question must always be, what is an Apostle? Note, here, Acts 1:18-22, etc., and 2 Cor. 12: 12. Well, I think we misunderstand what Acts 1:22-33 and 2 Cor 12:12 are teaching. If you want my full theology on apostles and apostles today, you can check out this in depth PDF document. If you would read the document I left a link for, you will see how I answer all those usual challenges.